I listen to Krell and Mark Levinson compaire to MF M250, there is sounds very little diffrence. but the price for the MF is a big big saving. 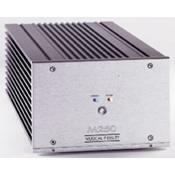 This is powerfull clean 250w@8ohm and 450w@4ohm good looking and space saving mono amp for a real world price. I got my first pair about 4 yrs ago and just bought the second pair again for another pair speakers. AUTO ON OFF WITH AUDIO SIGNAL. VERY GOOD BASS CONTROL. HI POWER. CAN BE HIDDEN AWAY. HI SENSITIVITY CAN CAUSE GROUND LOOPS WITHPUT CAREFULL SYSTEM HOOKUP. ONLY RCA HOOKUP , NO XLR. GOOD FOR DIY SUBWOOFERS. SET IT AND FORGET IT! I AM A HOME THEATER BUFF! I LIKE MUSIC AND LISTEN TO IT A LOT BUT HT IS BIG FOR ME. I AM ALWAYS TRYING TO GET BASS THAT WORKS FOR HT AND MUSIC. THIS PAIR OF MONOBLOCKS WOULD HAVE BEEN 2400 USD PLUS TAX AND SHIPPING IN 2002. I PAID 1350 USD IN 2007. I HAVE THEM FED BY A RCA CABLE COMING OUT OF MY OUTLAW AUDIO BASS MANAGER. THEY DAISY CHAIN SO IT GIVES ME THE ABLITY TO RUN TWO M250 IN ORDER TO RUN TWO DIY SUBS. MY HT USES AN AUDIOREFINEMENT PRE 5 AN AUDIOREFINEMENT MULTI 5 AN OUTLAW AUDIO BASS MANAGER AND A MODDED PIONEER UNIVERSAL DVD PLAYER ALONG WITH FIVE SONIC IMPACT T AMPS. I BI AMP MY FRONT LEFT ,CENTER, RIGHT SPEAKERS USEING THE MULTI 5 FOR FOCAL 7W CONES EACH SPEAKER HAS A PAIR IN PARALL AND THREE SONIC IMPACT T-AMPS FOR THE FOCAL TLR TWEETERS. THE REARS USE FOCAL 7K415S WITH FOCAL TLR TWEETERS ALSO BIAMPED WITH THE MULTI 5 AND SONIC IMPACT T-AMPS. I AM USING TWO FOCAL 8 INCH SUBS BEHIND MY COUCH WITH THE MUSICAL FIDELITY M250'S TO DRIVE THEM. I PLACE THE FOCALS IN SIMPLE TRUCK BOXES USED FOR SUBS. I ATTACH AN MDF BAFFLE TO THEM CUT FOR THE DRIVERS AND THEY SLIDE RIGHT BEHIND THE COUCH ALONG WITH THE M250'S. THESE AMPS HAVE AN AUTO ON FEATURE THAT FIRES UP QUICKLY. THE BASS IS REALLY GOOD WITH THESE AMPS. THE FOCAL CONES ARE THE 21WX MODEL VERY HIGH END FOR AUTO USE BUILT FOR CLEARITY AND POWER. THE CONTROL OVER THESE CONES BY THE M250'S HAS TO BE HEARD TO BE BELIEVED. IF YOU WANT A HIGH END DIY SUB FOR YOUR HOME LOOK FOR THESE AMPS ON EBAY AUDIOGON ETC. USE THEM WITH GOOD QUALITY CONES 8 OR 10 INCH THE MORE THE MERRIER. I AM GOING TO BUY A THIRD M250 AND ADD A THIRD FOCAL DIY TO MY SYSTEM. I FEEL THAT AFTER SIX YEARS OF BASS CHASE I HAVE CAPTURED THE SOUND I WANT DUE TO THESE AMPS AND FOCAL SUBS. PURCHASED USED FROM UPSCALE AUDIO. THEY SHIPPED FAST PACKED WELL AND WERE POLITE ON EMAILS AND PHONE CALLS. MARANTZ MA500 MONOBLOCK, MA700 MONOBLOCK AND AUDIOSOURCE 5.3 MONOBLOCK.